It's been awhile since I've participated in Jo-Lynn's weekly carnival, but now that I'm getting my blogging groove back, I thought it would be a great way to meet some new bloggers and maybe get some new people to come by and say hello. 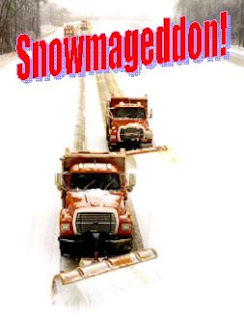 If you are one of the very few who don't own a tv or radio haven't heard this past week we have experienced, what people are calling, Snowmageddon here in Delaware. Two weekends ago we got almost a foot, then this past weekend another foot (some places almost 2 feet), and today we are bracing for another storm coming in this evening through tomorrow with what could be another foot. So in honor Snowmageddon, I thought I'd share with you all what I learned about blizzards in Delaware. Anything that you need to know about what's happening with the weather can be found on Facebook and Twitter. Forget the weather channel. Instant updates directly from the people who are experiencing it. Traffic information, precipitation news, closures, openings, meal plans, snow activities for kids, ways to keep your sanity...it's all there. Love my social media! Everybody makes French Toast when there is a snowstorm in Delaware, hence the disappearance of all milk, eggs, and bread immediately following talk that there is a blizzard on its way. (Actually this happens with the announcement of 2-4" so I'll leave to your imagination what the forecast of a foot of snow meant for the local grocery stores). Some people truly believe that we still live in the good ol' days where the supplies may not be able to get in for weeks because of the snow. except when it comes to eating. I'm very productive at eating everything in site. Blizzards are NOT good when you are trying to lose weight. Don't buy property on a secondary road in Delaware unless you also buy a truck with a snow plow. If you lose power it could be days before it is restores because you know, you live on a secondary road. Invest in a husband who lovingly will head out into the blistery wind and blowing snow to clear the driveway. Never mind because he really wants to play with the snow blower he borrowed from his dad. Boys and their toys. If a husband is not an option, then invest in a good snow shovel along with Advil, wine (you may not want to use them both at once), and bubble bath. Show the world that you don't need a man! The most important thing I've learned though is that I still LOVE snow days. I sit anxiously at my computer refreshing the state school closing website waiting to see my district listed, then hoot and holler when it finally shows up. I enjoy being at home with my own kiddos playing in the snow, making snow cream, watching movies, playing board games, oohhing and aahhing over Lego creations, artistic masterpieces, and new dances just choreographed. Getting up when I want rather than when the alarm says too, only to put on my pj's for the day...bliss! Oh yes, I am still in love with snow days. If you were lucky enough to experience Snowmageddon with me this week, what did you learn?? 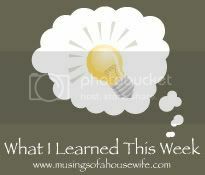 Don't forget to visit Musings of a Housewife to see what everybody else learned this week and then join in the fun by posting your own lessons so we can come by and visit you too! See, now I am TOTALLY over this whole snow thing! I'm in MD and my WILTW was about snow too! I am also completely UN-productive when it snows. I'm just hoping to get our taxes done. At least I can file them online! I loved reading this. Being originally from Maine and having experienced all of that, now that I'm in Florida, I can tell you for certain that I don't miss it! LOL! Just be thankful that I'm not there with you because I'd be making french toast right along side you, oh and cookies, and probably brownies as some point! LOL! so is that what they all do with the bread, milk and eggs I have always wondered LOL. What a great list! We escaped the last few storms, and I was disappointed! Looks like there's no escaping the one coming tonight though - I'm hoping to make some snowmen! What you are experiencing this year we had last year and so I feel both your pain and joy. We had so much snow at once that the schools had to close down for a week. I enjoyed reading about your week! I've learned how beautiful 20 inches of snow looks in my neighborhood. The snow on the trees with the blue sky in the background- just gorgeous. I learned that I can take care of all 3 kids by myself (one is a newborn) while my husband braves the storm to plow and salt. I learned that it is fun to build marshmallow structures with the kids when the power is out! I totally agree about Twitter. Love it. I get all my news there. ;-) I, for one, have been loving the snow. But I'm about done with it.